Dementia in people under the age of 65 is not well recognised and is generally treated in the same way as it is in people aged over 65. However, the evidence shows that these patients, and their carers and members of their family, experience dementia differently from people aged over 65. They need specific assistance from a range of agencies when receiving the diagnosis and through the progression of the disease. Such assistance encompasses working closely with the patient and their family, and an interdisciplinary approach across boundaries to address their complex needs. 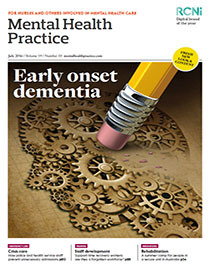 This article critically explores the additional challenges faced by the younger population suffering from dementia, including the service provision, pathways and delivery.